Admittedly this is an old adapter; I bought it in 2004. ScopeTronix mentions the EZ-Pix II on their website, but I can't tell what's new about it because the links on the website don't work. The scope setup and camera are the same. The digital camera adapter is a ScopeTronix EZ-Pix. 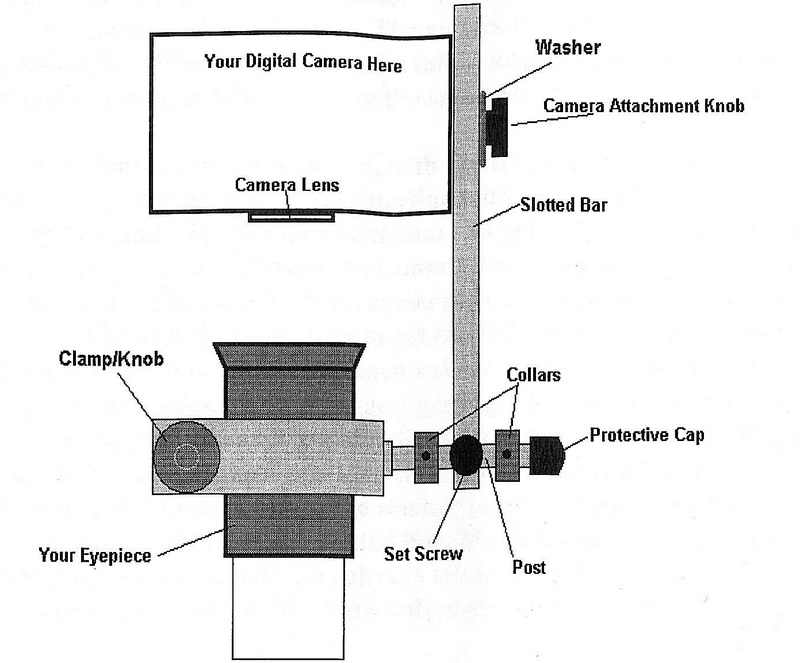 Rather than using a cylinder that slips over your eyepiece and another cylinder that slips over the first and attaches to your camera via its filter thread, this system uses a padded clamp that attaches to your eyepiece, which is attached to a slotted bar, which in turn is attached to your camera's tripod mounting hole via a screw and optional spacer. All these variables, however, make it a bit tricky getting the camera aligned to the eyepiece just right. 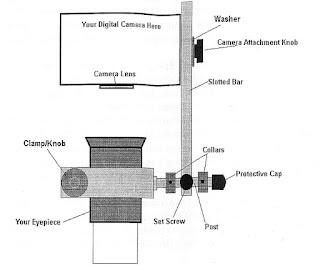 Once it is, however, you "only" need to loosen the clamp, remove the assembly and replace it again when switching from viewing to digiscoping and back. A further disadvantage if you're using a zoom eyepiece is that the entire adapter-camera assembly turns when you zoom in and out, making zooming impractical. In addition, the clamp covers the magnification markings on the eyepiece ("25x", "60x", etc.). This adapter originally costed $49.95. I can't tell what the current model costs because, like I said, the links on the website don't work.